Another selection from the diary of GRACE GROWDEN GALLOWAY was posted on 2 December 2013: “I now defye the Villans.” What follows is the inventory of the household goods confiscated from the Galloway house on Market Street. Although it does not seem complete it gives an idea of the kind of possessions the Galloways had. Joseph Galloway and Betsy settled in England where Galloway was awarded a pension of £500 per year. In 1779, Grace Galloway was given the opportunity to buy back her property and even to put it in her own name. After much thought she decided not to do so since she would be obliged to pay taxes (to the Rebel cause which she did not support) and also because she could be charged with treason. Grace died in 1782 without being reunited with her husband and daughter. She willed her property to Betsy even though she had no legal right to do so since it was technically owned by the state of Pennsylvania. After Joseph Galloway’s death in 1802, the Pennsylvania Supreme Court ruled that Grace should not have been punished for her husband’s wrongdoings and restored the entire estate to Betsy and her heirs. Sources: Pennsylvania Historical & Museum Commission and Wikipedia. Turn’d to that heavy lifeless lump a wife. Life became complicated as the Revolution approached. Joseph Galloway opposed independence and as a member of the First Continental Congress proposed a conciliatory plan toward Britain. It was rejected. After the Declaration of Independence was approved Galloway, fearing for his safety, fled to a British camp and then to New York City where he joined the British forces. By now a staunch Loyalist, Galloway followed General William Howe when he occupied Philadelphia and became that city’s Superintendent of Police and of the Port. In 1778 Pennsylvania passed a law by which property of Loyalists was confiscated. A substantial amount of Galloway’s holdings included property inherited by Grace, and when the British evacuated the city she determined to stay on —alone, since her husband had left with her beloved daughter—to try to save it. More from the diary Grace Galloway kept during this period in the next post. Sources include Texts on The Origins of Liberty Rhetoric, 1770s-1820s and History of American Women, which can be viewed HERE.
. . . a little time Unmolest’d holding our Selfs in Readiness to fly again, if the enemy moved this way, they are not yet in motion in the Jerseys, but have sent some Ships up the north River, and Destroyd one of our magazines, many think, as I told you in my last, that their Arms will be turnd to that quarter this Spring, the Congress has appointed General Gates Commander of our northern Army, he fully expects to be visitd by them, but the Discovery of a plot last week, makes me Affraid he is mistaken, and that this is still their object, theres a fellow who is Commissioned by Lord Howe, been tampering with our Pilots, makeing them great Offers, and promises of makeing their Fortunes, if they would go with him to New York, the Honest fellows, took 50 pounds as an Earnest of their promise, but with the good intention of proveing the fact, went Immediately to the Generals and lodged their Information, Accordingly he was produced and Confessd the Charge, he is an Englishman, has Served Cucessively the late mayors of this City as a Clark, went to new York, was Introduced to Lord Howe, by your Freind Joseph Galloway for those purposes which Commission, has Ended this day with his Life. . . . Mr. Hancock intends Resigning his Seat in Congress and going home, it is Imagined he will be appointd Governor of Boston, they meant to have Complimentd Mr. Morris with the Presidentship [of Congress] but he told the Gentlemen who informed Him of it, he could not Serve, as it would Interfere intirely with his private Business, so begd it might be drop’d, any peice of Intelligence I give you that only Concern our Selfs and freinds, I hope will be confined to Mr. Halls Family. . . .
[D]on’t you feel quite important, I assure you I do, and begin to be Reconsiled to Independence. . . .
as it would have save[d] him a good deal of Pain. Mary wrote again on April 8 urging her parents to come to Philaldephia. [I]t is well worth the Ride to see how Confident every one now seems of Success, Except the Torys, theres no Other news from the Camp, than that Deserters are comeing in Constantly, who all agree, that the Enemy are very Sickly, and a general Defection between the Hessian and British Soldiery, these accounts joind to the Curcumstances of their not moveing yet, all this fine weather, Joind the good News from France, has given Life and Spirit to every body who wishes us Success. . . . we have reason to think, there will be a Bank Established in France, for the Support of our Continentall money. . . .
Joseph Galloway, mentioned by Mary, became a Loyalist during the Revolution. 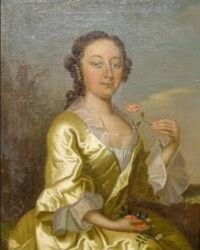 His wife Grace Growden Galloway was unhappy in her marriage and remained in Philadelphia after the British evacuated to try to prevent the property she brought to the marriage from being confiscated by the Patriots. She was unsuccessful. Her husband took their only surviving child Elizabeth with him when he fled to New York. After the war, Galloway lived out his days in England. When Mary says “I . . . begin to be Reconsiled to Independence,” she indicates that she as well as her husband were not initially in favor of independence, although they resented the actions of the British. Her husband in fact absented himself from the Congress when it voted for independence so that Pennsylvania’s vote would not be divided. He later signed the Declaration of Independence placing his signature right beneath that of John Hancock and committed himself to the American cause. The letters come from the Robert Morris Collection at the Huntington Library, Lists No. 5, pages 53-55, transcribed by Louise North. [Microfilm, courtesy of Dr. Elizabeth Nuxoll]. During the Revolution, property belonging to Loyalists was subject to seizure. Very often some part of that property had belonged to their wives. But under English law, any property a woman owned at the time of her marriage became her husband’s, unless there had been a premarital agreement. As a result, many Loyalist wives had no legal claim to their inheritance; they found themselves in dire circumstances, evicted from their homes and forced to seek refuge with relatives or friends. Grace Growden was one such woman. The daughter of a wealthy Quaker businessman, she had married Joseph Galloway who was active in Pennsylvania politics. Though initially uncommitted, he ultimately sided with the British becoming the civil administrator in Philadelphia when the British occupied that city. He left with the British when they evacuated in 1778, taking his daughter Betsy with him. These lines from a poem Grace wrote show that she was not exactly happy in her marriage. “Never get tyed to a man/for when once you are yoked/’Tis all a mere joke/of seeing your freedom again.” Grace stayed behind in the hope that she could retain her inherited property. She was not successful. The day after the British departed Charles Willson Peale (yes, the painter) appeared at her door with an eviction notice. 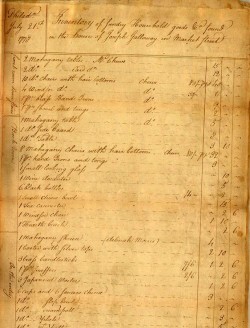 The contents of the Galloway house on Market Street were sold at auction (see illustration). Peale received a five percent commission. Embittered and impoverished, her diary entry in April 1779 showed Grace nevertheless still defiant. Tusday the 20th [While visiting a neighbor, I] got My spirits at command & Laughed at the whole wig party. I told them I was the happyest woman in twown for I had been striped & Turn’d out of Doors yet I was still the same & must be Joseph Galloways Wife & Lawrence Growdons daughter & that it was Not in their power to humble Me for I shou’d be Grace Growdon Galloway to the last & as I had now suffer’d all that they can inflict Upon Me I shou’d now act as on a rock to look on the wrack of others & see them tost by the Tempestuous billows while I was safe ashore; that if My little fortune wou’d be of service to them, they May keep it for I had exchanged it for content: that a Wooden waiter was as Useful tho not so sightly as a silver one; & that wou’d Never let these people pull Me down for, While I had the splindid shilling left, I wou’d be happy in spight of them; I cou’d Not do as Diogenes (Drink out of the first brook therefore threw his cup away as Useless) but I wou’d keep My Wooden cup if I cou’d get No other; & be happy to the last if I cou’d not get a silk gown I cou’d get a Linsay one & so it kept Me warm I owed Not. My borrowed bed I told them was down & I cou’d Lay Me down & sleep composely on it without feeling one thorn which was More than the Creatures cou’d Do who had rob’d Me: but all that vext Me was that I shou’d be so far humbled as to be ranked as a fellow creature with such brutes for I cou’d not think they cou’d be call’d Men, so I ran on & was happy. . . . am not sorry at anything I said for I now defye the Villans. It was ruled that Grace’s inheritance could not revert to her until her husband died. He outlived her, but their daughter Betsy claimed the property in 1802 after her father’s death. The diary entry appears on page 126 of In the Words of Women. The inventory can be found HERE.